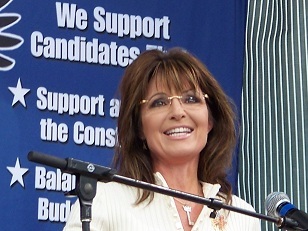 This entry was posted on Monday, September 5th, 2011 at 11:48 and is filed under Election 2012, GOP Candidates, Politics, Sarah Palin, Tea Party, Update. The Restoring America Rally on Saturday was a stunning success, despite the deluge of rain that drenched the gathering crowd as the downpour began forty minutes before the event’s start. The lightning and rain threatened an early end to the event. A few departed due to the torrential rains when it became clear that the weather would persist. From my vantage point as the storm swept over, there were many who simply turned their cars around and went home within sight of the venue. The rains depressed turn-out, but for most of the people already at the scene when the rain began, the soaking they endured was a small price to pay. 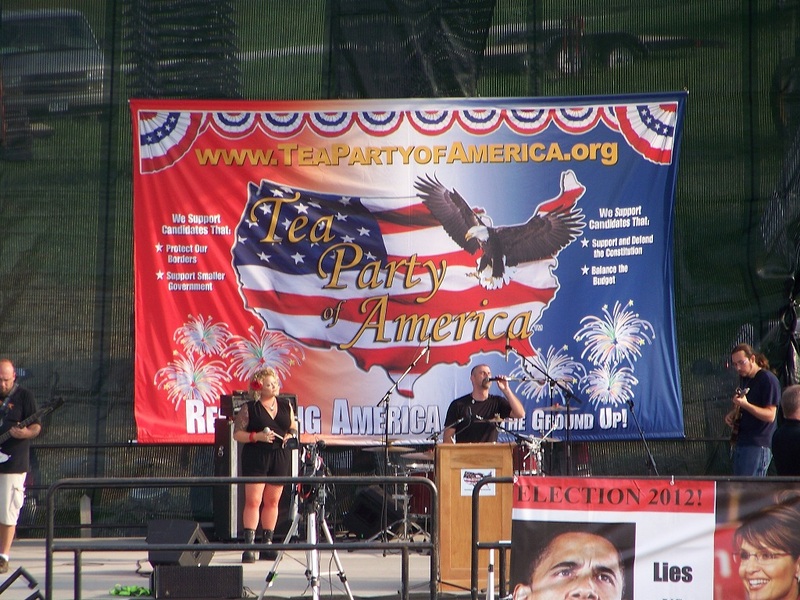 Some attendees, my own daughter included, were soaked to their skin, yet the abiding enthusiasm of Tea Party goers and Sarah Palin supporters wasn’t dampened. Estimates vary, but given what I witnessed and what I was able to see and count, there were some 2500-3000 people on hand by the time Governor Palin began her keynote address. In another demonstration of Sarah Palin’s ability to connect with average Americans, the event ended with the sun breaking through as she connected with her supporters. 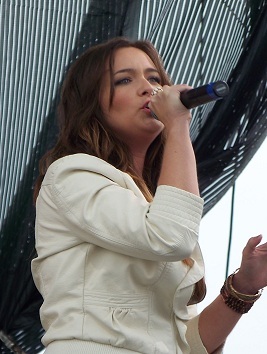 The performers and speakers did their best to soldier on and the crowd did its best to keep dry, but the heavy downpour made that proposition impossible for some. 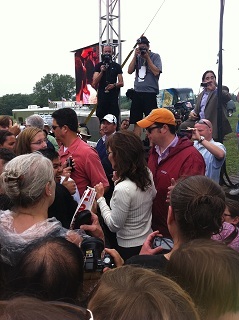 The sizable Texas contingent, of which I was a part, seemed the least prepared for rain, but who could blame them? Their state hasn’t seen rain in so long that they may have forgotten the concept. The fascinating aspect was the diversity of license plates to be seen in parking. On a brief walk around parking, I was able to identify plates from as far away as New York, Florida, Maryland, Arizona, California, and Nevada. The greatest numbers were clearly from Iowa, Kansas, Missouri, and other states in the region, but I would estimate that at least one-half of the plates were non-Iowa, and of those, nearly half were non-Midwest. 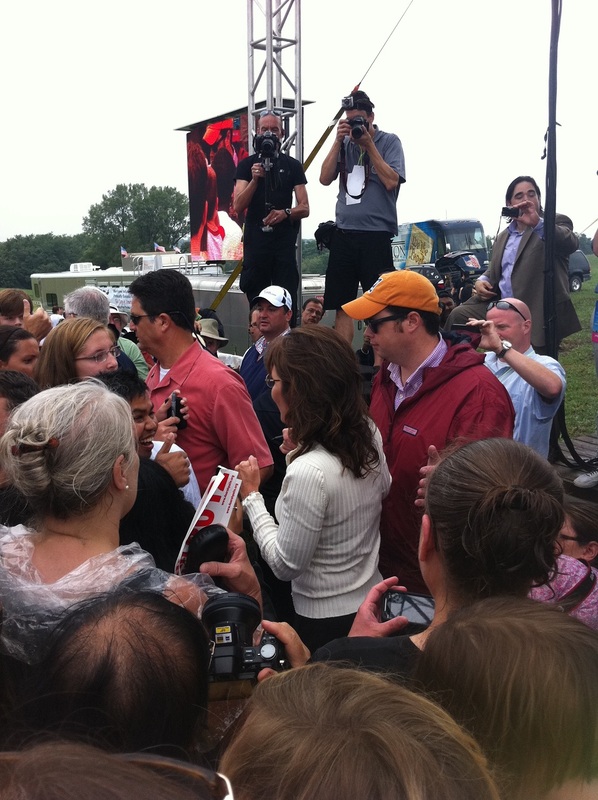 At the rally, I spoke with people from both coasts, and from Alaska. 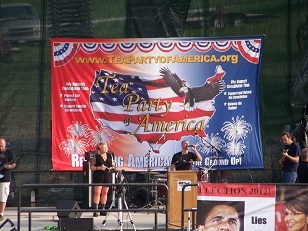 Begun in a downpour, the event completed as the sun finally cut through the retreating storm while Sarah Palin spoke. Maybe that’s significant, because as she began to speak about the solutions she would offer to the country, laying out a clear plan for the first steps in restoring America’s economy, the sun broke through and she was bathed in sunlight as the sun warmed the backs of the rain-soaked audience. The media was in its usual frenzy, and the crush of photographers and camera men was a phenomenon I witnessed first hand in the front row. Despite the mess the rain had begun to make of the field, Governor Palin came down into the crowd after the address to greet the adoring audience, shake hands, sign autographs, and give hugs to those adoring supporters. 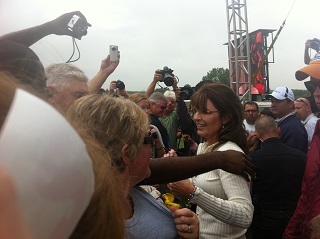 In at least one case, Sarah thanked a supporter for his enthusiasm during this event. She noticed. Joshua Thuma, arriving from College Station, Texas, was seated only occasionally as he mostly stayed on his feet in cheering support. 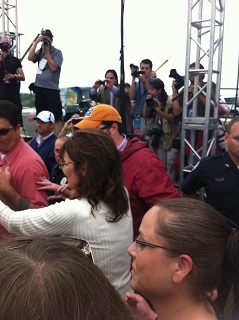 The former Alaska governor, on her trip down the rope line after her address, went out of her way to thank him for his enthusiasm. This one instance among many like it typifies what endears Sarah Palin to so many. She must have observed his vocal and visible support during the speech, and she made sure to take the opportunity to thank him for it. This is what the media seems always to miss, but Sarah’s supporters appreciate most: Governor Palin notices even the little things that matter to ordinary Americans, because the same things matter to her, too. That is one factor that many in the press, accustomed to the cynicism and deceit of politics seem never to capture. One could rightly wonder whether they notice, but choose not to report it, or instead are simply to desensitized by cynicism to notice it any longer. 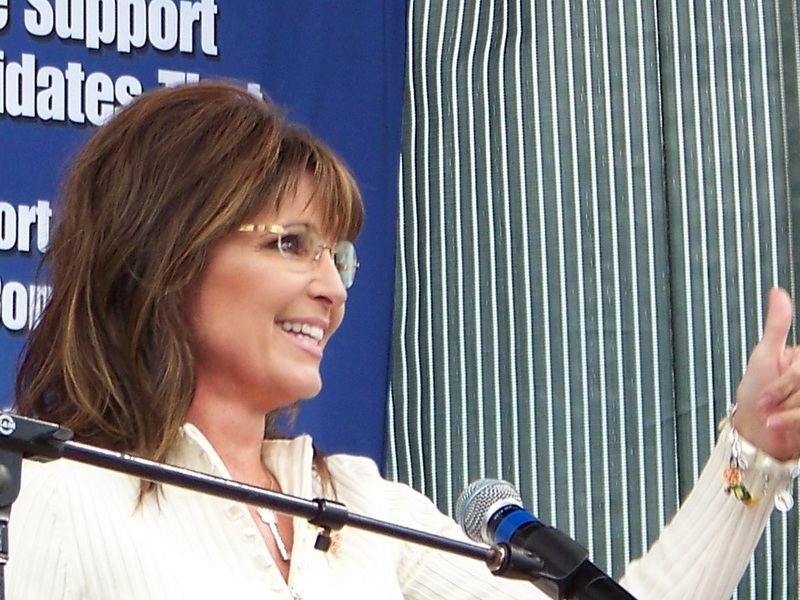 Never mind what the media notices, because Sarah Palin’s supporters notice it, and others are also beginning to take note of the sincerity that characterizes not only her supporters, but more importantly, Sarah Palin, herself. She means it. This isn’t an act, and this is what the professional punditry must know though they’ve lost the ability to appreciate or even understand it: She’s the genuine article. They may not understand it, but they see it as dangerous. Her supporters aren’t the fair weather sort. They brave distances, rain, snow, sleet, hail and almost anything you can heap upon them to deter their support, and it will do nothing but cause the core of them to a firmer resolve. This determination is expressed in Sarah Palin’s person, and the throngs of “Palinistas” seem to understand that this is their candidate, not only in principles, policies and values, but in the unwavering fortitude to stand up and fight. 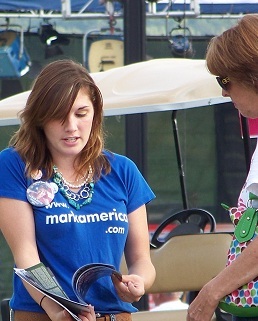 Throughout the event, there were thousands of reasons for attendees to take real hope, but in the half-hour after her speech, the scene on the ground made it clear why Palin’s political prospects are brighter than ever: She was amongst everyday, ordinary Americans, and she loves them, because she’s one of them. They know it, and love her too! Amazing article! Thanks Mark! I love your blog! Thank you Joshua! It was terrific to meet you! Absolutely wonderful, as always. This is a wonderful compilation of many of the highlights and captures the spirit and energy of the event. It was an honor to meet you and your wonderful daughter. I'm sharing the link to this on our new Minnesota4Palin fb page. Thank you Rose! It was wonderful to finally meet you! I look forward to seeing you again one day! Well done Mark. I wish I could have been there. Thank you for your effort to tell the true story of the event! Thank you Linda! I wish you could have been there too! You'd have loved it… If you think my article was good, the event was much better. In an odd way, even the rain served its purpose.